Lucerne, 15 September 2017 - In 2016 Emmi raised sustainability to a strategic issue and for the first time published specific global sustainability targets for the whole group. Since then the company has received increased attention from sustainability-conscious investors. The Luxembourg investment company ÖKOVISION LUX S.A. has also taken a close look at Emmi’s commitment to sustainability and honoured it with the ÖKOVISION Sustainability Leadership Award. The independent investment committee of the global sustainability fund Ökovision Classic is marking its 25th anniversary and, together with the fund company Ökoworld, has honoured nine especially exemplary companies - among them Emmi. The investment committee of the Ökoworld Ökovision Classic fund, one of the oldest ecological and ethical funds in Europe, marks its 25th anniversary this year. Members of the committee include representatives of environmental, human rights and consumer protection organisations and experts on green and socially responsible business. With the support of Ökoworld’s sustainability research this group of experts reviews the companies proposed by the fund managers, decides on their inclusion in the investment universe on ecological, ethical and social grounds, and monitors them on an ongoing basis. If the investment committee rejects a company, the stock may not be bought. On 14 September in Düsseldorf the investment commitment presented its nine favourite companies in the ÖKOVISION investment universe to an audience of media representatives, investment specialists and sustainability experts. These nine companies are intended to serve as exemplars to demonstrate what a company has to do to pass the test to be included in the fund, which currently has a universe of some 350 securities. Key thematic pillars in the fund include healthcare, education, nutrition, energy, water, infrastructure, environmentally friendly transport, digitalisation and social media. 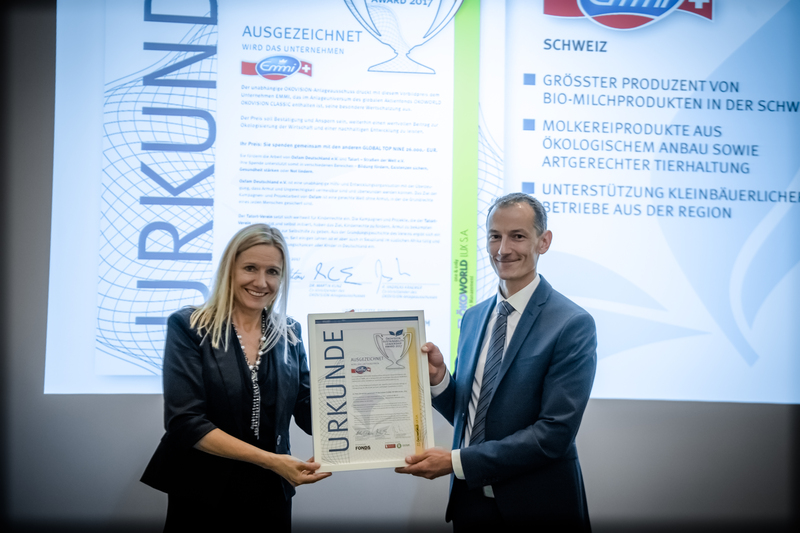 The award to Emmi was on the basis of its strong position in the organic segment and its commitment to highly sustainable milk. The following companies were also honoured alongside Emmi: Amore Pacific (Korea), Arçelik (Turkey), JR-East (Japan), Electrolux (Sweden), Hermann Miller (USA), Kone (Finland), Philips (Netherlands) and Vestas (Denmark). ÖKOVISION LUX S.A. was established in Luxembourg in 1995 and was the first investment company to invest solely on sustainable principles. It is a subsidiary of ÖKOWORLD AG, which has been listed since 1999. ÖKOVISION launched its first sustainable fund in 1996. The ÖKOVISION SUSTAINABILITY LEADERSHIP AWARD was first presented in 2012. An independent investment committee selects the top nine from the 350 companies in the ÖKOVISION investment universe. Members of the committee include representatives of environmental, human rights and consumer protection organisations and experts on green and socially responsible business. On the occasion of the 25th anniversary of this committee the 2017 Award is being given for the second time.